The Problem: Creating a new app for people who want to find a unique dining experience that has great ambiance and is relatively close. All within an app that is easy to use and navigate. The Solution: Foodie - an app that shows the latest restaurants, the local restaurants around your current location and a way of making a reservation effortlessly. • Will make reservations if the place is popular/trendy to beat the crowds. • Prefer making online reservations over phoning it in (due to the wait of being put on hold/rude service), though if you can’t get your time/date that you want, you might be able to get it if you call in. • Some people will research the menu before going to get a feel for what meals they serve. • Location is somewhat important - wouldn’t travel more than a half hour to get to restaurant. • Would trust a recommendation for a place to eat especially if they’re out of town. • Some custom online reservation utilities can be misleading and confusing - the screens are too complicated or can’t be understood how to use the utility. 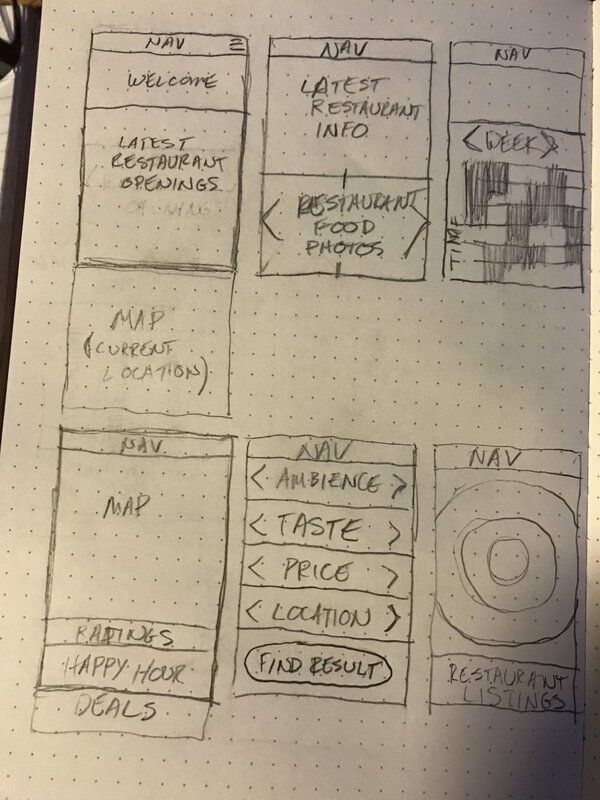 These discoveries led to sketching out a mobile app, first on paper and then in a low fidelity wireframe in Sketch. After creating these initial layouts, a site flow map was created to map out a user's path. And then finally this led to high fidelity prototypes. 1 Navigate to the map to select a restaurant. 2 Navigate to a restaurant's detail page. By testing the app on 4 users, it revealed that the app was fairly easy to use, with a few usability points that will be addressed in future iterations.